Icons are arranged in chronological order. The collection begins with the oldest icons dating back to the 15-th and 16-th century which are painted in trend of the Byzantine art. In next chambers, the icons of 17-th and 18-th century are displayed. These icons enable to observe significant stylistic and iconographic transformations dictated mainly by dominance of the renaissance and baroque art, the styles of the western art. The exhibition is ended with rich collection of icons from the 19-th century. This period is a time of decline of that kind of painting. Amongst the leading iconographic themes the images of Christ Pantocrator, the Virgin Hodegetria, Virgin Eleusa, Virgin Pocrova and Deesis composition are dominant. 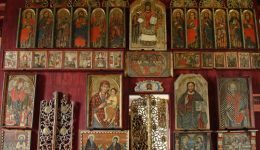 Another group of paintings, presenting hagiographical themes, forms an independent group of icons which depict saints of the Eastern church along with the scenes of their life. The group is represented by images of St Parasceva of Tyrnovo, St Nicholas, St Basil. The icons of the Last Judgement and Passion are rich with suggestive symbolic based on evangelical events. The exhibition is enriched with an iconostasis consists of icons from turning of the 17-th and 18-th centuries. The iconostasis is situated at the 1st floor. 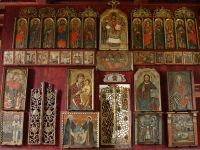 More about: The Orthodox and Greek Catholic Church art collection of the 15th - 19th c.